Tecnigas Silent Pro exhaust system for 4 stroke engines. Fits all 50cc GY6 4-stroke scooters with 12 or 13 inch wheels. The manufacturer provides the system with fittings, clutch springs and variator rollers. Perfect replacement road legal exhaust. 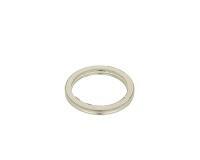 Exhaust gasket must be ordered separately. Tecnigas is one of the best known GY6 50cc QMB139 Scooter muffler and high-performance quality exhaust manufacturers from Barcelona, Spain. They are known world-wide for providing some of the best scooter exhausts in the European racing circuit. 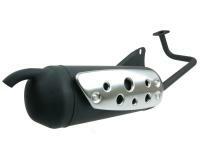 Racing Planet USA carries the full range of Tecnigas exhausts for mopeds, 50cc and Maxi Scooters. This is an A+ Rated replacement Muffler for your stock 4T QMB139 Scooter at significant savings over an OEM replacement.